Delve into a world where obsession of patterns and a world of dots hallucination materialize into a captivating art form. Suicidal in nature, Japanese artist and writer, Yayoi Kusama, is still alive and breathing at the age of 84 and still creates works of art that is vibrant, dynamic, sensual and remains relevant even at this time. “Art is my therapy!” She says, whenever she has suicidal thoughts, she would ask her “art” what she would do. A contemporary of Andy Warhol, Kusama led a fascinating life despite her bitter childhood, yet her work is exuberant that it even inspired designers from Louis Vuitton to create a line after her. 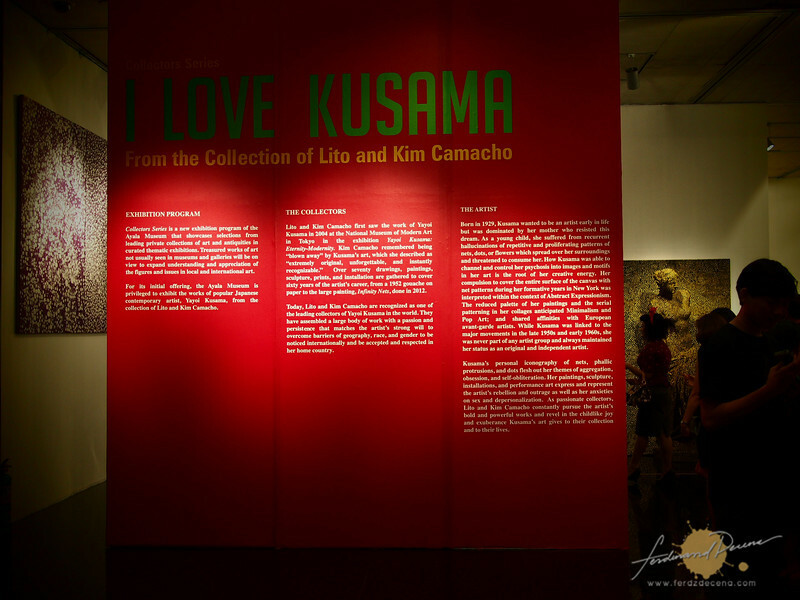 For the first time in the Philippines, Ayala Museum presents Kusama’s works in “I Love Kusama” exhibit, an unraveling of more than 200 original art and commercial pieces from the private collection of Lito and Kim Camacho. 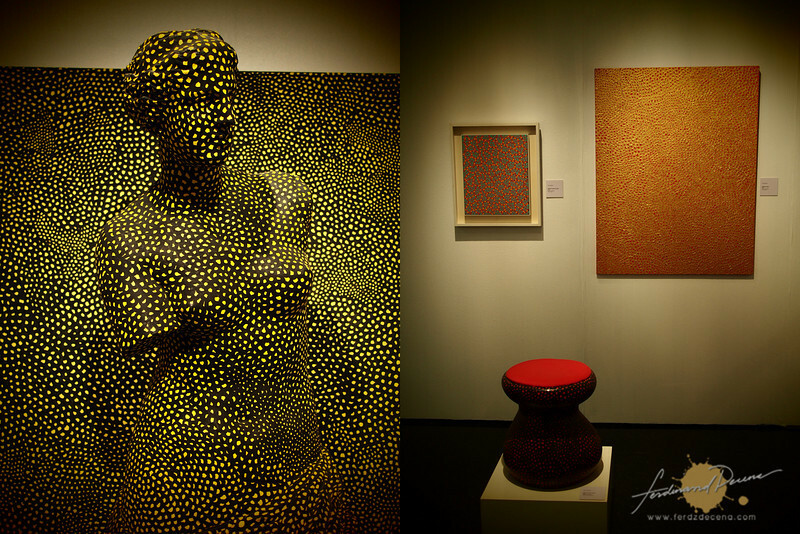 “I Love Kusama” is the first of Ayala Museum’s new Collectors Series exhibition program. “Some of the best work of art is in the hands of private collectors” says Mariles Gustilo, Senior Director of Ayala Foundation. Thus Ayala Museum aims to showcase the treasures of private collectors like Lito and Kim Camacho who admire the works of Kusama. The series gives the people the opportunity to see art pieces not usually shown in public. After seeing Kusama’s work, it’s hard not to say “I Love Kusama”. I must admit, I know little about her prior to this exhibit, but learning about her life, her struggles as an artist and seeing her bold, wild, imaginative and vibrant work is simply inspiring and mind blowing at the same time. Learn more about Yayoi Kusama in her “I Love Kusama” exhibit, which runs from 16th July 2013 until the 1st of September 2013. 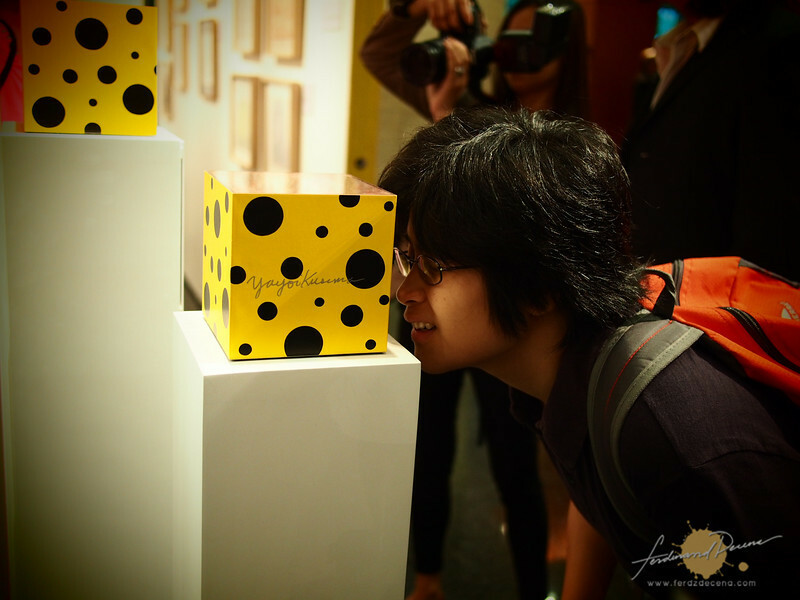 On the 10th of August 2013, leading expert on Kusama’s work, Akira Tatehata, will give a one-time lecture at 4pm, Ayala Museum Ground Floor Lobby. Jei from Ayala Museum here, thanks for this post! Just wanted to clarify that exhibition runs until September 1 only, not November 1. Hope you can revise. Thanks! Oh I must be really sleepy last night. Thanks for noticing that Jei!